What is it that drives some people to take the road less traveled? Why is it that some people become employers and others employees? Why do some people leave what is known to go off and become explorers of the unknown? Is it passion? Is it a fire in the belly that won't easily be quenched? Is it curiosity, an insatiable thirst for knowledge? Is it a desire to be different, to climb out of the rut and to go along a different path? Is it a disdain for security, the thrill of discovery, the adrenaline rush that accompanies risk? I'm not sure exactly what it is. Maybe it is a combination of all of the above. But, whatever it is that drives these people, El and Bill Fiero possess that "something" that drives them to see around the next bend or to discover what lies beyond the next hill. I first became acquainted with Bill and El while waiting for my truck to be repaired. Lying on the table next to my chair was the August/September 2011 issue of BoatUS Magazine. 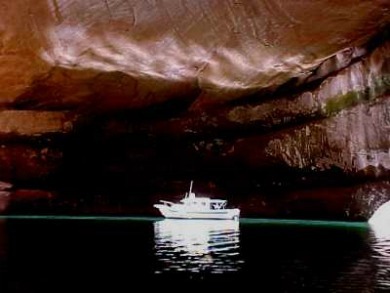 The cover showed a small boat surrounded by beautiful red and coral sandstone cliffs that could have only been taken at Lake Powell. Naturally, I picked up the magazine and read the cover story, "A Space Odyssey" written by Gary Kramer. 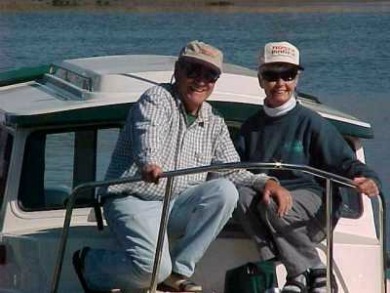 In this article, I learned that El and Bill Fiero, who were teachers, retired in 1984 at the relatively young age of 50 to follow their dreams of exploration and discovery. "...all the rivers that the United States Corps of Engineers says are navigable by powerboats. They've been in the Pacific, Atlantic, and the Gulf of Mexico; have cruised waters in 29 states; and have repeatedly been in Canada - logging more than 28,000 miles on Halcyon, named for a mythical bird that built her floating nest at sea...."
The Halcyon is a trailerable 22-foot C-Dory Cruiser which they purchased in 2000. 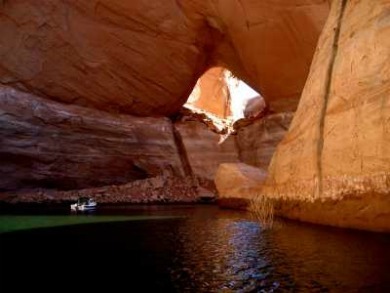 "Our C-Dory first touched fresh water in Lake Powell (as our 20-Flicka sailboat first touched water in Walden Pond)." I think you will agree: "the Fieros have sailed the waters less traveled." The images on this page are from their website and are used with their kind permission. Join in and write your own page! It's easy to do. How? Simply click here to return to Guest Columnist Page.